Pilgrims have sought souvenirs and relics of Jerusalem and the Holy Land from the days of the earliest pilgrimages to the sacred sites. 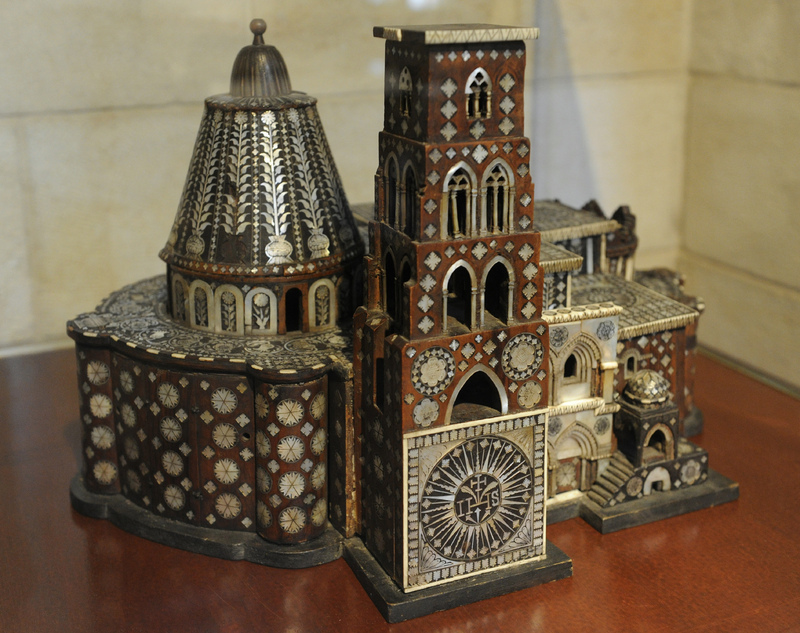 In the seventeenth century, wooden models of the Church of the Holy Sepulchre, which was believed to built on the site of Jesus’ crucifixion, became particularly popular as a pilgrim souvenir. Part of the appeal was that such models could be taken apart, which made not merely for easier transportation but also, and more interestingly, gave pilgrims the opportunity to re-live their pilgrimage by looking inside and rediscovering the different chapels and areas of theological interest within the church. Each model would be labelled with numbers indicating important places in the church, such as the site of Calvary or the burial tomb, and would be sold with a key scroll for ease of use, identifying the sites associated with the particular number. This particular model has been inlaid with mother-of-pearl and was based on designs made by Bernardino Amico, a priest who served in the Holy Land from 1593 to 1597 CE. Made of wood and inlaid with mother of pearl; 28.5x45 cms.